The goal of the NeuroTechnology Center (NTC) is to create a collaborative community of interdisciplinary neurotechnology researchers, educators and entrepreneurs, leveraging synergistic interactions and nascent collaborations. The NTC directly responds to the BRAIN Initiative by creating a strong neurotechnology node in the greater New York City area, taking full advantage of a high local density of interdisciplinary neurotechnology researchers, educators and entrepreneurs. Members of this Center have a strong track record in creating novel tools for neuroscience research. Moreover, this Center incorporates some of the leaders that inspired and guided the BRAIN initiative. The research mission of the NTC is to draw together interdisciplinary neurotechnology groups across several universities and private institutions, leveraging the combined expertise to jointly develop advanced molecular, optical, electrical, and computational technologies for the study of complex neurobiological systems. This Center will provide scientific and intellectual cohesion to an already existing and collaborative group of independent researchers in the biological, physical and engineering sciences, enabling them to work together on ambitious problems that individual laboratories cannot address on their own. The Center will consist of four thrusts which mirror the focus of the BRAIN initiative: an imaging thrust to develop novel tools for in vivo imaging of brain activity; a molecular and chemical thrust to create novel molecular probes for measuring or altering neural activity; a nanoelectronics thrust to use advances in nanotechnology and microelectronics to build dense neural probes; and a computational thrust to provide novel tools for data analysis and computational modeling of large-­scale neural data. The NTC will address key challenges in neuroscience, such as voltage imaging and manipulation of neuronal activity in three dimensions. 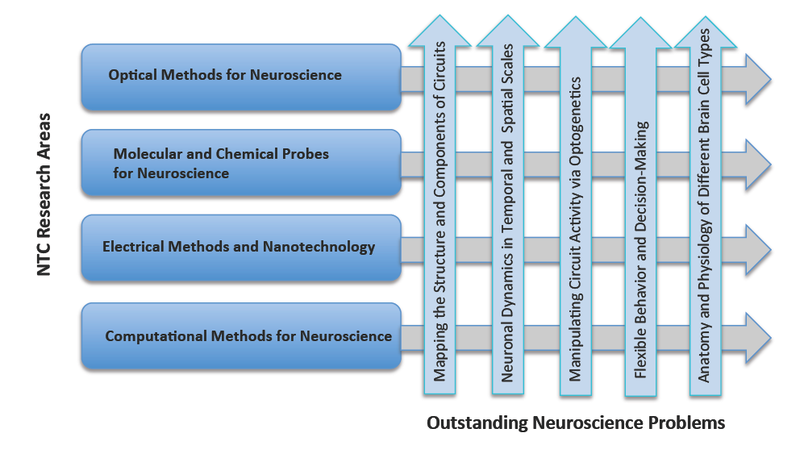 Projects sponsored by the NTC will also address the development of novel in vivo optical methods; molecular, chemical, and microelectrode technologies; and novel computational methods to analyze large­scale recordings of neuronal activity. These technologies will be developed with close interaction with neuroscience researchers who will be natural users and early adopters of these technologies. The educational mission is to train undergraduates, graduate students, postdoctoral researchers and faculty in the newest neurotechnologies. Students supported by the NTC will be supervised by at least two different PIs, enhancing existing collaborations and forming new ones. Students will present their research in a bi­annual NTC Open Studio Course and profit from an annual symposium. By anchoring some of the educational and training programs at Queens College­CUNY, which one of the most diverse student populations in the country, we will enable access to novel technologies by groups traditionally underrepresented in the sciences and engineering. To capitalize on the economic applications of novel neurotechnologies, the NTC will also have a business development mission. To increase the employment options of NTC students and postdocs beyond traditional academic careers, we will create an internship program with existing local bio-­incubators in Harlem, with the goal of fostering a local neurotechnology industry. This program aims to provide the skilled work force that leads and sustains startup companies, as well as engages with traditional medical electronics and pharmaceutical enterprises. The outreach mission is to raise public awareness of neuroscience. We will support a new mobile NeuroBus with microscopes and neurotechnologies developed in NTC labs, sponsor a BioBaseII program in Harlem, and have a vibrant outreach program with open days and lectures.